Adrian Benepe, New York. Benita Hussain, New York. Parks are not simply pleasant amenities, but serve as a foundation to the social, economic, environmental, and mental health of communities. By ensuring every resident of every city lives within a 10-minute walk of a park, we can fundamentally and positively impact the quality of life for hundreds of millions. Since the mid-nineteenth century, parks have always been deeply intertwined in the modern identities of cities. In the U.S., Central Park is less a feature of New York than it is a key component of its essential character, much as Prospect Park once similarly defined the emerging city of Brooklyn, and Brooklyn Bridge Park defines the “new” Brooklyn; Boston Common remains a testament to Boston’s proud, revolutionary past as Balboa Park in San Diego and Golden Gate Park in San Francisco embody those cities’ forward-looking idealism and promise of opportunity. Small cities and towns too have their Central Parks, if not always in natural and architectural splendor, yet still in their importance to nurturing communities through the provision of a truly public space. It’s possible, however, that many planners and civic leaders continue to greatly undervalue parks as key pieces of a city’s ecological and social fabric. This is evidenced by how one in three Americans lack access to a park within a 10-minute walk, leaving more than 100 million people deprived of easily accessed green space, creating a cascade of impacts on mental and physical health, and even economic opportunities for these cities. This is why The Trust for Public Land (TPL), in partnership with the Urban Land Institute (ULI), and the National Recreation and Parks Association (NRPA), launched the 10-Minute Walk to a Park Campaign, a movement to ensure a great park within a half-mile of every person, in every neighborhood, in every city across America (see how the 14,000 American cities and towns fare here). The Trust for Public Land and its partners founded the campaign on the essential premise that parks and open space not only have vast inherent value in connecting urban dwellers to nature, they also have a multitude of other benefits that make them versatile and comprehensive solutions to the diverse array of challenges cities increasingly face, and will continue to face as the U.S. and all other nations continue to urbanize. Parks foster social interaction and provide gathering spaces, they also improve the economies of surrounding neighborhoods, and, consequently, the encompassing city, through the appreciating value of nearby properties, growth in tourism revenue, and the provision of free and accessible recreation. 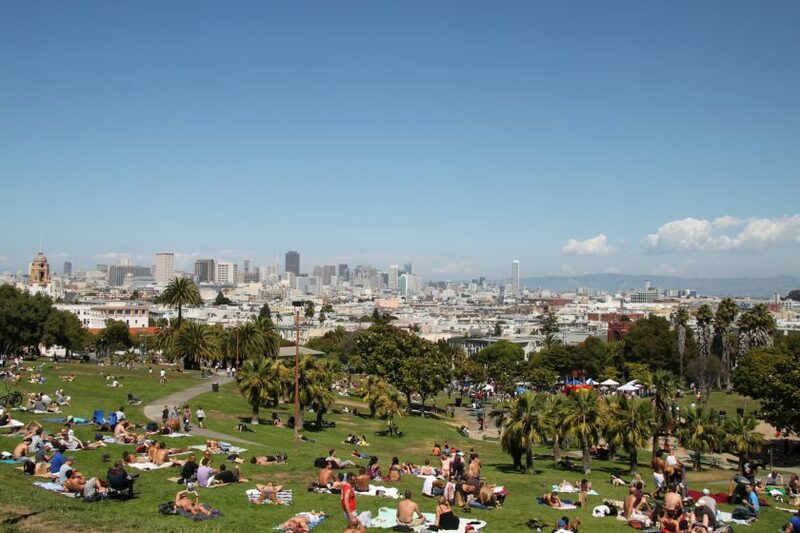 The environmental value of parks is similarly significant, from their ability to soak up storm water runoff and keep it out of storm sewers to their ability to regulate temperatures in our urban “heat islands”, lowering temperatures by as much as 7 degrees Fahrenheit. 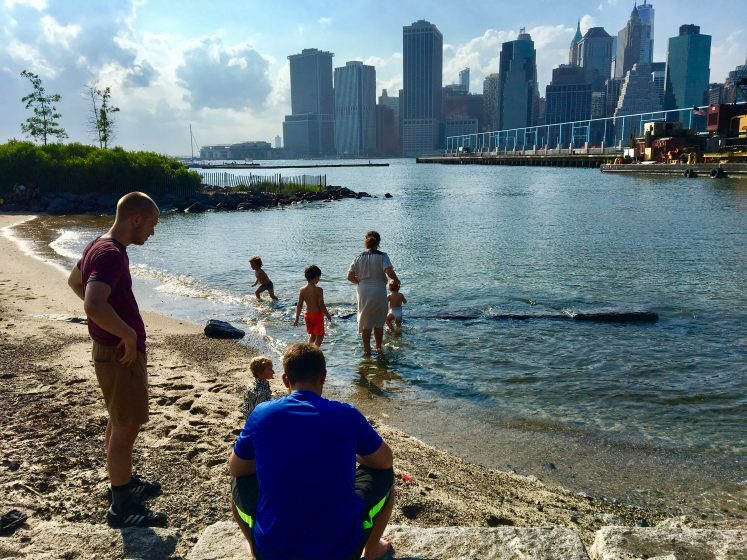 As cities become forced to think increasingly about extreme weather events and heat due to climate change, parks and more open green space will provide efficient and sustainable alternatives to impervious, heat-trapping gray infrastructure. Public health is also affected by the presence of parks. The built environment in which we live factors strongly in how our individual health is determined, particularly in how it can encourage or discourage active and healthy behaviors. Parks, in conjunction with a host of other factors, including employment, adequate transportation and housing, strong social ties and access to health care, can positively affect the health and wellbeing of a neighborhood, in turn reducing costs and addressing latent inequities. Parks then are not simply pleasant amenities but serve as a foundation to the social, economic, environmental, and mental health of communities. By ensuring every resident of every city in the U.S. lives within a 10-minute walk of a park, we can fundamentally and positively impact the quality of life for hundreds of millions of Americans. 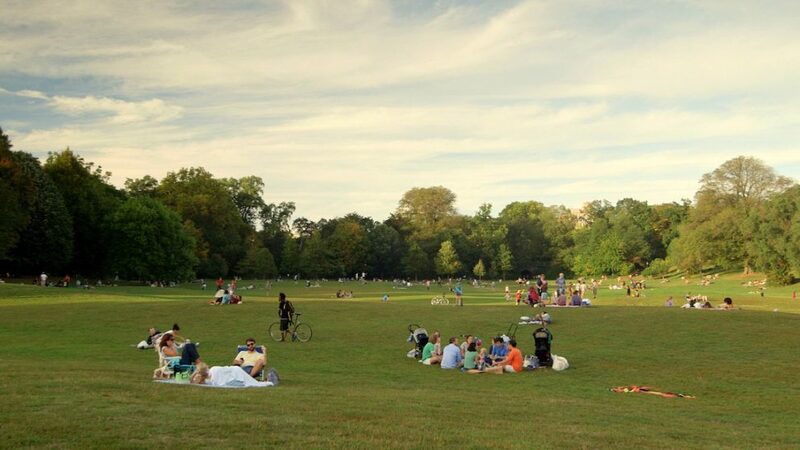 More city officials are now realizing the intrinsic and instrumental value of parks. This is reflected in the fact that, as of February 2019, more than 240 mayors have signed onto the campaign. Mayors from Anaheim, Topeka, Memphis, Boston, Chicago, Minneapolis, Oakland, and Washington, D.C., among many others, are taking actionable steps towards realizing a 10-minute walk to park vision, adopting the principles and strategies laid out by the campaign, and working closely with experts from TPL, NRPA, and ULI to design new master plans that propose ways in which their citizens can all have easy access to green space. Lewisville, Texas is one of those cities that has recently committed to this goal and has met words with action. A suburb of Dallas with a high concentration of immigrants and refugees, the city composed an updated parks and open space master plan with funding from our campaign’s planning grant, aiming to ensure 85 percent of the city’s residents live within a 10-minute walk to a park by 2025. Equity is a top consideration of Stacy Anaya, Director of Lewisville Parks and Recreation, who has called her city a testament to how “poor urban planning contributes to a systematic segregation of access to public spaces and services”. They’ve engaged community members and brought in partners such as Chin Community Ministries, the Youth Action Council, and Keep Lewisville Beautiful to ensure full participation in the creation and implementation of their roadmap to the 10-minute walk vision. In Tukwila, Washington, a diverse and growing suburb of Seattle, city officials set out to engage their community in plans to reach 100% 10-minute walk park access. Another recipient of the technical assistance grant, Tukwila’s mayor, Allan Ekberg, announced, “Parks play a critical role in the health and well-being of our communities. In Tukwila, we are proud to engage with our diverse communities in connecting all our residents to quality local parks within a 10-minute walk from home.” Tukwila will, by 2020, have adopted a new Park, Recreation and Open Space plan. Boston is perhaps the ultimate example of a city that has taken its 10-minute walk commitment seriously. 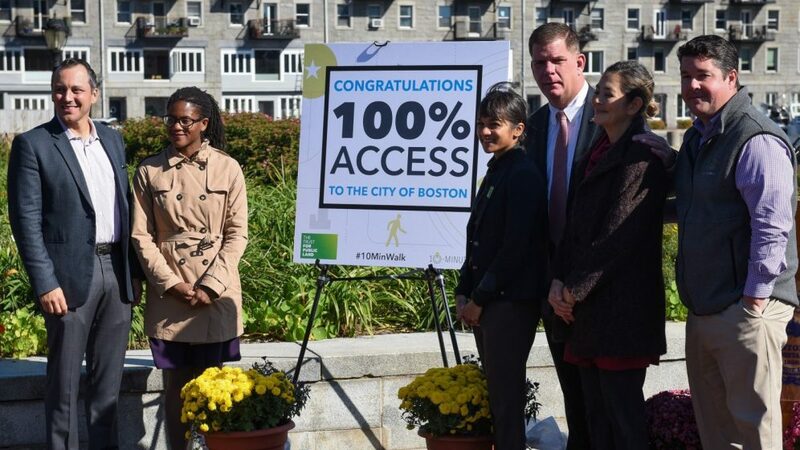 In October 2018, Mayor Marty Walsh and city officials announced that they reached 100% 10-minute walk to park access. To reach this milestone, Boston city leaders leveraged a data-driven approach to craft a master plan that pinpointed underserved neighborhoods and offered creative and comprehensive solutions to meet those needs. 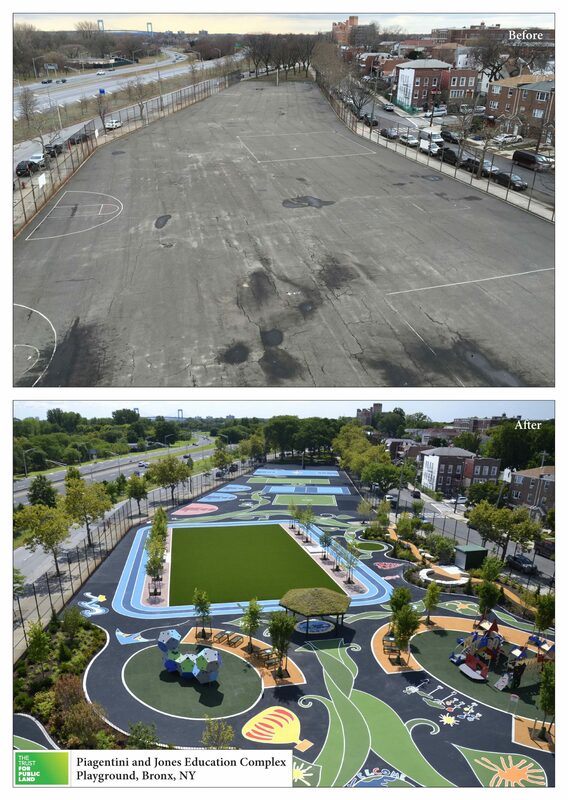 Joint-use agreements—those between the city and the education department, which allow schoolyards to be used as public parks outside of school hours—also helped create new forms of open space in communities that may have otherwise lacked it. Boston, however, continues to invest in its park system: the city recently allocated $230 million to parks through. Imagine Boston 2030, and their Resilient Boston Harbor initiative includes parks as a key of part of its effort to strengthen Boston’s climate resiliency. Benita Hussain, Director of the 10-Minute Walk Campaign, with Boston Mayor Marty Walsh. For many cities, shared-use agreements between school districts and municipal governments offer perhaps the clearest path towards comprehensively realizing the 10-minute walk vision at scale, particularly in dense geographies. Often poorly equipped, locked after school hours, and consequently underutilized, schoolyards are places with vast potential, capable of being transformed into neighborhood parks that forge new relationships between nature—and the myriad of benefits that come with it—and communities. These new “green schoolyards” that double as water absorbent, green infrastructure are, as Children andNature define them, “multi-functional school grounds designed for and by the school community that [offer] places for students, teachers, parents and community members to play, learn, explore and grow.” In New York, TPL has led the transformation of over two-hundred asphalt lots into green schoolyards, serving 4.5 million people within a 10-minute walk. Other cities are beginning to implement this strategy, Boston being one of them. Since 2014, the city and schools of Philadelphia in partnership with TPL have created green schoolyards that provide 10-minute walk to a park access to 136,412 community members. A pilot program of five sites in Oakland will serve 34,000 people with 10-minute walk access. Green schoolyards can be the lynchpin of a city’s plan to provide more neighborhood park access to its residents. The 10-minute walk to a park vision is spreading across the country, as it becomes accepted by more communities and embraced by a growing number of mayors and other civic leaders. 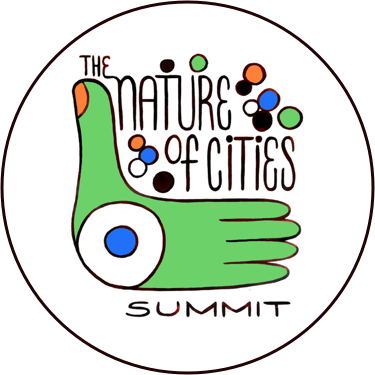 And this vision, founded on the knowledge that parks are multi-benefit keystones of every neighborhood, is a major part of any solution to the mounting challenges cities face. Cities such as Boston are leading the way, while smaller communities including Tukwila and Lewisville are planning and spearheading their own, ambitious efforts. All share in a common belief: that access to green space creates more vibrant, inclusive cities for all. 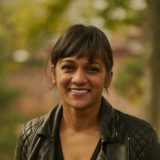 Benita Hussain is a former advisor to Mike Bloomberg and late-Boston Mayor Tom Menino with corporate law degree and 15 years of experience in climate change, cities, and sustainable development. 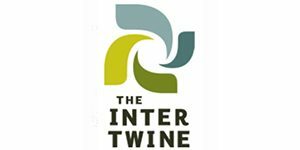 She currently leads Trust for Public Land’s national 10-Minute Walk Campaign to expand green spaces in cities. We would like to suggest a parallel campaign for parks to offer much more to attract users than simple grassy areas and sports fields. If you provide society with an enhanced incentive to engage their parks, there will be much more interest in expanding numbers and access to the parks. It is always our ideal to give the public incentive which makes reaching goals much easier.